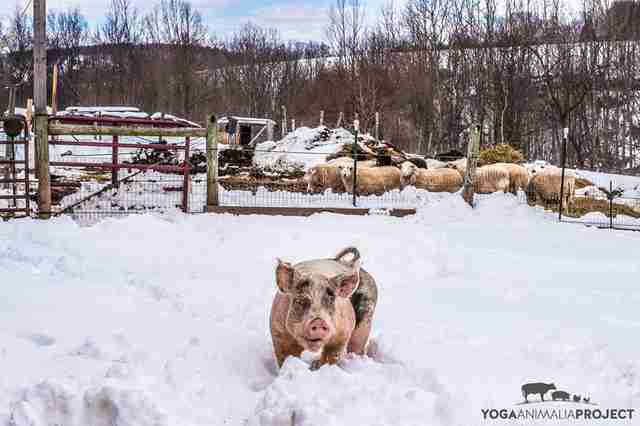 When rescuers peered into Gavin’s filthy makeshift pen at the New Paltz, New York, farm he was found at last summer, they noticed something strange: Compared to the other pig he was living with, a mother with several young piglets, Gavin was skin and bones. Since Gavin was in the worst shape, he went home with Lahiri to Indraloka Animal Sanctuary for around-the-clock care. 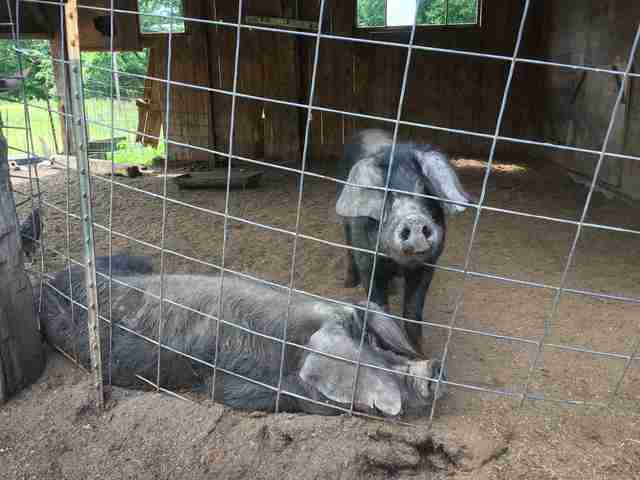 Some other pigs on the property, including another mother pig and her babies, went to Woodstock Farm Sanctuary. 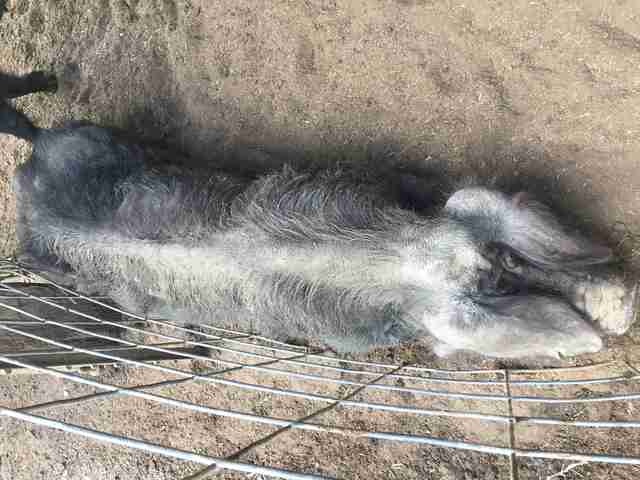 Each pig on the farm was checked over by a vet and tested positive for all the same parasites — so rescuers were even more puzzled as to how Gavin had gotten so much skinnier than the others. But it wasn’t only the food and medicine that helped Gavin feel better. 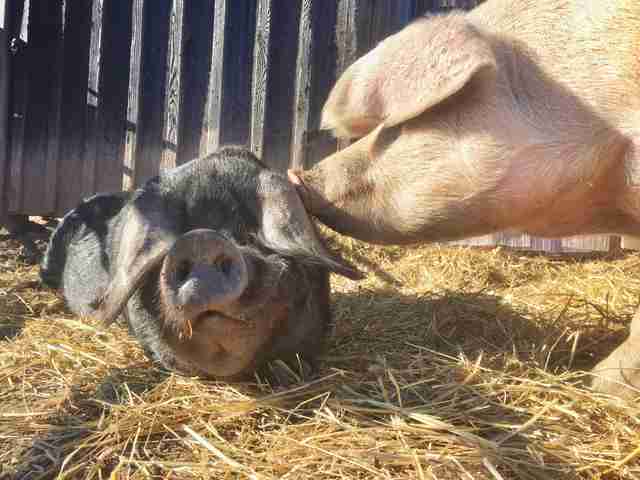 Through the fence, he met Miss Lily Pie, a 3-year-old pig whom the sanctuary had taken in as a baby after she had escaped a slaughterhouse transport truck. By fall, Gavin was healthy enough to be introduced to Lily out in her pasture — and they quickly became the best of friends. But they began to notice something unusual — even though Gavin loves to eat, he was saving some of his favorite treats to give to Lily. 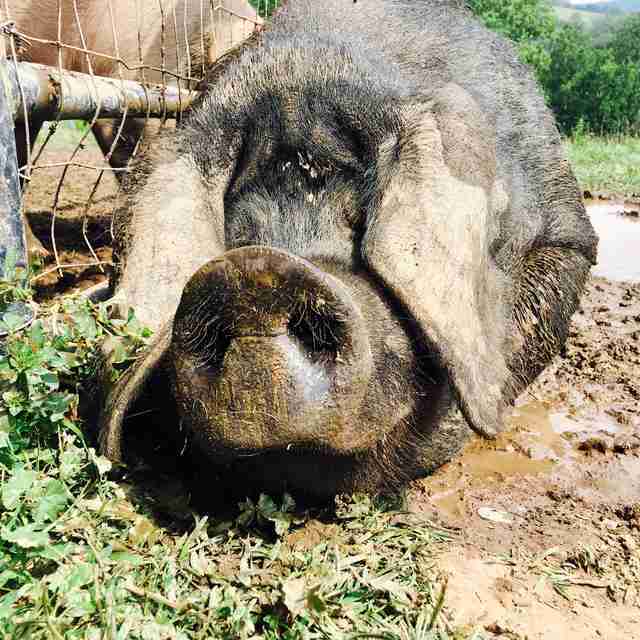 It was then that his rescuers realized why he had gotten so skinny at his old home: He was likely saving any food that did show up for the mother pig and her babies. 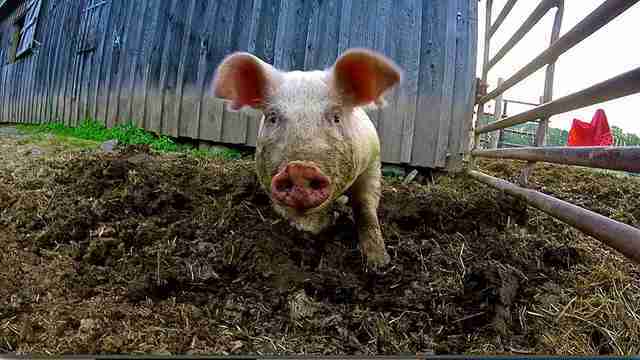 Now, Gavin lives alongside Lily and another pig named Dominic. All of the animals rescued the same day as Gavin now have forever homes, too — including his former pen-mate, Molly, who lives at Woodstock Farm Sanctuary. 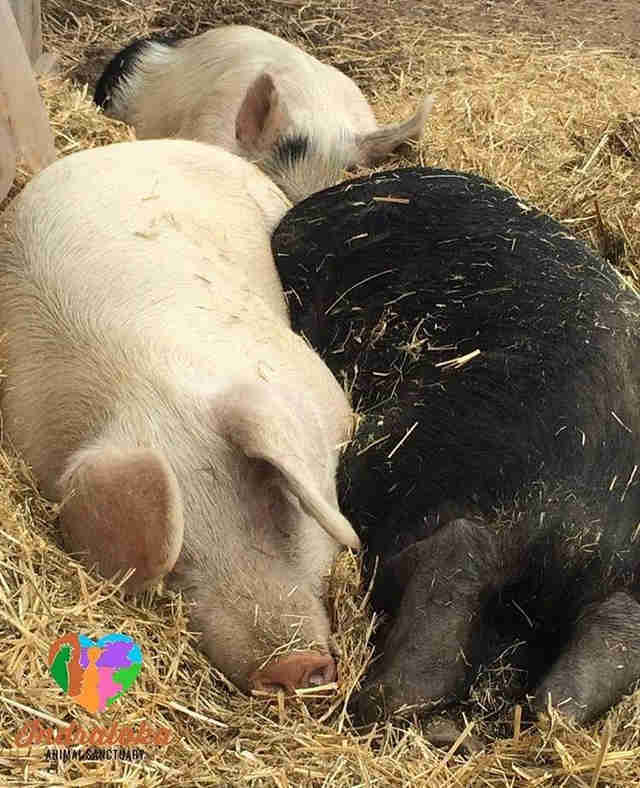 Each night, Gavin, Lily and Dominic settle into one big pig pile to sleep. They spend their days grazing and playing in the pasture together. 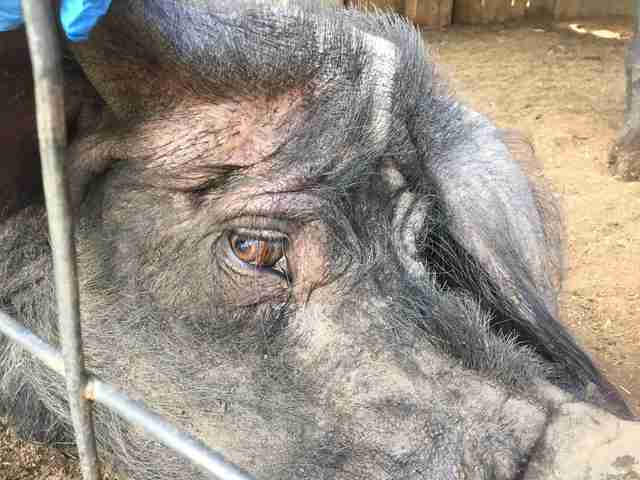 To support the continued care of Gavin and his friends, you can make a donation to Indraloka Animal Sanctuary.